While it’s critical to take care of your eyes at every age, older adults are especially at risk for diseases such as age-related macular degeneration (AMD), which can lead to central vision loss that significantly influences their ability to see details on others’ faces or complete activities such as driving, reading, or cooking. Real eyes, real impact People diagnosed with early signs of AMD may not experience vision loss for a long time. 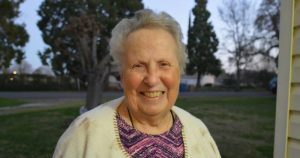 About 15 years ago Jean, now 84, visited her optometrist for help treating her dry eyes. After dilating her eyes, Jean’s eye doctor detected signs of AMD and told her to call him if she experienced changes in her vision.“I didn’t notice any changes until about a year and half ago, when I saw that straight lines were slightly wavy,” Jean said. “I would close my right eye and see waves, so I could tell it was affecting my left eye more. My doctor referred me to a specialist, who diagnosed that I have ‘wet’ AMD in my left eye.”The ophthalmology specialist prescribed injections, one of the therapies that may help slow vision loss. Jean now visits him once a month for a procedure that looks like this and costs her $30 to $60 each month, which can be tough on her fixed income. Although she’s gotten slightly more used to the injection process, for three days after her appointment she sees floaters in her field of vision and can’t shower due to the risk of getting water in her eye.She’s hopeful that the treatment is slowing her vision loss, but anxious that she may lose her vision in her left eye entirely or that her right eye could progress to a similar state. Meanwhile, she’s encouraging others to visit their eye doctor for preventative care and disease management.“I know a couple of women at my church who have AMD,” she said. “They kept putting off seeing the doctor for treatment, but I told them you get used to the shots. Now all three of us see the same doctor.”Maintain your eye health with just one visit” If you only remember one takeaway from Jean’s story, it’s to visit your VSP network doctor once a year for a comprehensive eye exam as it’s the only way to spot early warning signs of the disease. Because dilation enables doctors to detect and monitor changes to the cells beneath your retina, it can be one of the most important health appointments you make each year.If you don’t have vision insurance, VSP can help you save on your next eye exam or pair of glasses.